Ronald Reagan and Margaret Thatcher are alternately credited or condemned for instigating a global economic and political shift that began in the late twentieth century. For them, the state equated a force of repression from which businesses and individuals needed liberation and government was synonymous with theft. “It is good to recall how our freedom has been gained in this country, not by great abstract campaigns but through the objections of ordinary men and women to having their money taken from them by the State,” Thatcher once said. Not even nominally socialist societies in Scandinavia or Communist China were immune and belief in the transformative power of markets took on messianic proportions. Greed is good. Starting in the late 1970s, such views spread and neoliberalism became the dominant organizing paradigm for society. After gaining traction in the United Kingdom and the United States, it spread to the rest of the world. Not even nominally socialist societies in Scandinavia or Communist China were immune and belief in the transformative power of markets took on messianic proportions. Greed is good. Human well-being, the popular neoliberal narrative goes, is best guaranteed by prioritizing individual entrepreneurial freedom. Economic growth equals success-at-large and is best advanced through privatization, deregulation and liberalization. The state’s role is to maintain the integrity of money, keep basic order and organize the military. As a last resort, the state must safeguard the functioning of markets. Other than that, the market itself is said to regulate all other activity. With rhetoric like this it is not surprising that most of us have come to think of neoliberals as hostile to the state and intent on stripping government of as much power as possible. But this is a mistake, argues the historian Quinn Slobodian in his latest book, “Globalists.” In fact, he says, our tendency to focus on Reagan, Thatcher and their intellectual antecedents leads to a misinterpretation of neoliberal intentions. This necessarily results in a misdiagnoses of where the world is now as well. We do this, Slobodian contends, because we view the evolution of neoliberalism through the wrong neoliberals. 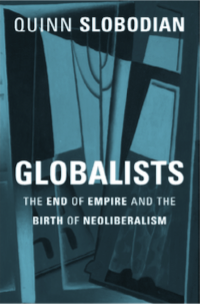 “Most histories of the neoliberal movement begin in continental Europe with the meetings in the 1930s and 1940s but shift their gaze to the United States and Great Britain,” he writes. This is a mistake. Rather than the predominant “Chicago School” of thinkers—most famously embodied by Milton Friedman, Gene Fama, Robert Fogel and others—and the group most closely linked with Reagan and Thatcher, we would do better to examine the thinking of the what Slobodian calls the “Geneva School” of scholars that were either academics based in the Swiss city, frequent collaborators or employees of the General Agreement on Tariffs and Trade (GATT)—the precursor to the World Trade Organization (WTO). Among this group he counts Wilhelm Röpke, Ludwig von Mises, Michael Heilperin, Friedrich Hayek, Lionel Robbins, Jan Tumlir, Frider Roessler and others. From the very beginning, Slobodian argues, these neoliberals consciously sought to transfer state power (which is often subject to some form of democratic control) to supranational institutions (which are not). While they were hostile to the nation-state, contrary to assumptions these neoliberals did not seek to do away with institutional power altogether. Few serious people dispute that power has shifted dramatically away from elected bodies in recent decades. Even those who would argue that this change is for the better would admit that institutions like the International Monetary Fund (IMF), World Bank, WTO or the European Court of Justice wield tremendous power and operate beyond direct democratic control. If the construction of such institutions occurred when neoliberalism was predominant this would seem to run counter to the claim that neoliberalism frees individuals from soul-crushing bureaucracies. Up until now, attempts to reconcile this discrepancy have been attributed to the difference between theory and implementation. In other words, practical real-world needs called for constructing such institutions and they thus grew organically. In contrast, Slobodian argues that this global architecture was not some accident of evolution or deviation from neoliberal theory, but rather the intention all along. Most histories of the neoliberal movement begin in continental Europe with the meetings in the 1930s and 1940s but shift their gaze to the United States and Great Britain. Neoliberals wanted to “encase” the economy, Slobodian writes, not liberate it. He cites the political economist Jamie Peck, who characterizes the neoliberal project as “a simultaneous roll-back and roll-out of state functions.” While the Chicago School argued that markets provided the only information needed to order society, the Geneva School combined the “Austrian emphasis on the limits of knowledge and the global scale with the German ordoliberal emphasis on institutions and the moment of the political decision,” Slobodian writes. Geneva School thinkers inverted the two-world concept of the philosopher, and Nazi jurist, Carl Schmitt, who sought to prioritize the world of imperium (the rule of the state) over the dominium (the rule of property). While Schmitt was concerned that property interfered with the necessary exercise of state power, neoliberals sought to bu er economic activity (dominium) from the impact of politics (imperium). None other than Hayek—the famed author of “The Road to Serfdom: and a thinker claimed by not only the Chicago and Geneva schools, but also by a third strand of neoliberal thinking, the Freiburg School—spoke of the need for “a double government, a cultural and economic government,” one that he thought could revive some of the governing principles deployed by the old Austro-Hungarian Empire. Indeed, the breakup of the Habsburg monarchy prompted a preoccupation with reconciling national self determination within the global economy. Unlike future waves of Chicago School thinkers, Hayek and others from the Geneva School were skeptical that markets alone would be sufficient for organizing society and, even if they were, that human beings were capable of interpreting market signals correctly. “On the one hand, the world economy had to be defended against the excesses of democracy,” Slobodian writes. “On the other hand, the world economy itself was invisible and beyond reason and representation.” To counter this conundrum, the Geneva School envisioned a dominium that operated above the level of the nation-state. While most of us view the Cold War and World War II as the most significant events of the twentieth century, Slobodian argues that neoliberal thinkers, the Geneva School and others, tend to emphasize three other historical ruptures: World War I, the Depression and the post-colonial world’s assertion of influence in the 1970s. The First World War spelled the end of the gold standard, the 1930s depression prompted protectionism and the 1970s saw poorer countries, for example, oil producing states, clamor for a greater share of the global economic pie. Such events translate directly into neoliberal emphases on monetarism, free trade and global institutions to enforce trade rules. In some of the book’s most interesting sections, Slobodian demonstrates how decolonialization—seemingly a good thing for anyone purporting to believe in individual liberty—frightened neoliberals. For them, the mass enfranchisement that followed was not a good thing, but a threat. “With the knowledge of possibilities spreading faster than the material benefits,” Hayek wrote, “a great part of the people of the world are today dissatisfied as never before and are determined to take what they regard as their rights. As their strength grows, they will become able to extort such a redistribution.” As Slobodian notes, the word “extort” does not exactly convey respect for democracy, the means by which those people would seek economic rights. Based at Wellesley College near Boston, Slobodian is the author of two previous books: “Foreign Front: Third World Politics in Sixties West Germany” and “Comrades of Color: East Germany in the Cold War World”. Like those, this book traces a detailed European phenomenon to its global impact. “My narrative presents a vision of neoliberal globalism viewed from Central Europe,” Slobodian writes, “because it was Central European neoliberals who most consistently looked at the world as a whole.” While disputing which group of neoliberal intellectuals had a greater impact on how neoliberalism was implemented may seem a specialized discussion, and their differences may seem subtle at first, the argument is sufficiently convincing as to fundamentally alter perspectives on contemporary problems. Geneva School thinkers inverted the two-world concept of the philosopher, and Nazi jurist, Carl Schmitt, who sought to prioritize the world of imperium (the rule of the state) over the dominium (the rule of property). Perhaps the strongest undercurrent in today’s populist political revival is the general feeling that voting—that is changing leadership democratically at the ballot box—does not matter. As power concentrates in institutions bereft of democratic oversight, such grievances feel legitimate. After reading Slobodian’s version of events, this anger feels even more justified. It is one thing to perceive the dispersion of power to non-democratic supranational institutions as some sort of evolutionary accident driven by the confusion and speed of globalization. It is quite another, however, to see this as the nakedly ideological intent all along. “If the world economy did not have a demos, this was precisely the point,” Slobodian writes. “It was a world of people but a world without a people.” Put simply, economics have globalized, politics remained national and a select few have been able to exploit that gap. In light of this, the Reaganist rhetoric that has sought to connect economic and political freedom for the past three decades is all the more cause for anger. For if capitalism and democracy were never meant to reinforce one another and democracy is instead perceived as a nuisance to overcome, then neoliberalism’s most vocal proponents were either liars (as they parroted a liberating narrative while simultaneously seeking to curb democratic influence), or stupid (as they really believed what they were saying even as neoliberalism reoriented society in the exact opposite direction). Unlike future waves of Chicago School thinkers, Hayek and others from the Geneva School were skeptical that markets alone would be sufficient for organizing society. And yet, even this might be excused, and the public could willingly cede global economics to experts and supranational institutions—so long as they believed that those experts could effectively manage economic affairs. In the wake of 2008, and the years of crisis that followed, few do. Experts are no longer perceived as making decisions based on expertise and all manners of institutions, from unchecked private sector investment groups, to colluding ratings agencies and incompetent international mediators, have failed the public. This is how the crisis fomented in Greece proceeded to years of enforcing economic policies that caused untold suffering, all to see Greece exit their second bailout in August 2018 with a debt-to-GDP ratio even higher than when the eurozone crisis began. Divorced from democratic oversight, it is hard to believe such illogical policy making will change, prompting yet more skepticism of institutions generally—including those that may offer alternatives. 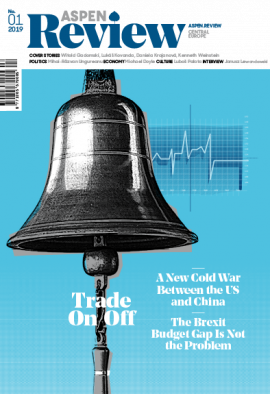 In the end, we are left wondering whether the neoliberal attempt to protect global trade by neutering politics may have broken democracy for good.